Sticky Date Popcorn was posted on June 29th, 2011 and is filed under Dairy Free, Gluten Free, Kid Friendly, Recipes, Snacks, Vegan. This entry has 24 comments. You can follow any responses through the RSS 2.0 Comment Feed. I’m back! Sorry it’s been a few days…there was a lot of traveling involved with this weekend’s concerts, and things took a little longer than expected. But I’m here now…bringing you a new favourite of mine. It’s reminiscent of caramel popcorn with the benefit of it not turning hard, which I’m not crazy about. 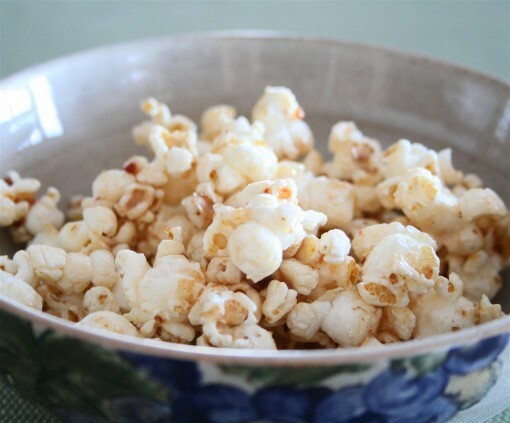 I like warm, sweet, sticky, gooey popcorn and this fits the bill perfectly…AND it’s healthy. Start by soaking the dates for an hour or so. 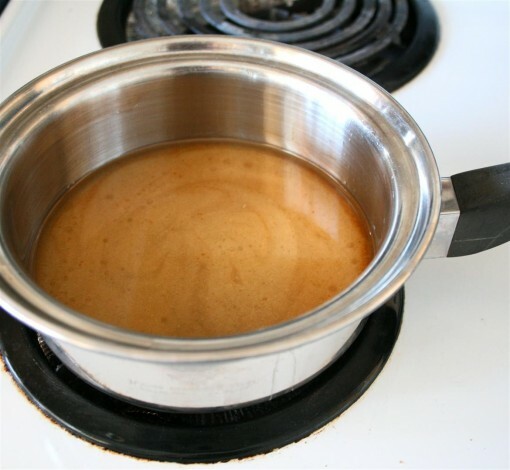 In a saucepan, melt the honey and combine the oil and vanilla with it. In the blender, add the dates (don’t forget to remove pits!) and the sauce mixture and blend until super smooth. And then you are free to devour! ( …I haven’t had breakfast yet, so now I’m craving sweet popcorn for my morning meal…maybe I can delay this craving till later. Maybe.) Kids just love this recipe…my nieces especially, can’t stop eating it…this is just a great alternative to kids eating the caramel stuff. Here’s a bonus recipe for you! If you are really crazy about caramel popcorn you can thin down my caramel apple dip recipe and top your popcorn with that! It’s crazy good…especially if you warm up the sauce before adding to the popcorn. Check it out! What’s your favourite popcorn topping? I think for the easy, shake-out-of-a-bottle kind, I like sea salt & vinegar and ketchup! Are you kiddddddddddding!? This sounds incredible!!!!!!!! I’m making this for sure! WOAH! What a fantastic idea to use a date-honey combo rather than a bunch of sugar! Wow, how did you think of this? What a great idea! I didn’t think it was possible. This is Genius! What a wonderful idea to sweeten popcorn. I can’t wait to try this little sweet snack here at home!! Nothing tastier than a gooey treat. Looks wonderful. That is SO awesome! I’m trying this for sure. 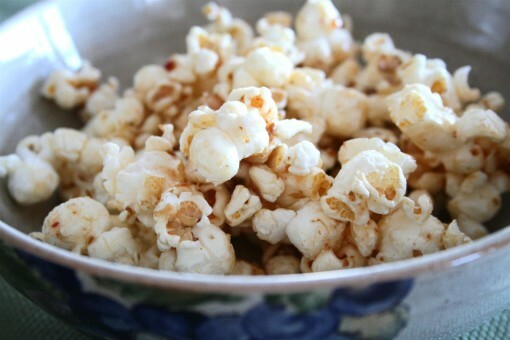 A much healthier caramel popcorn? Beautiful! Now that is a great idea! Love it: a healthy and delicious sounding alternative for the kids (and me of course). Thanks for dropping by my blog. Cool! I always pop my popcorn on the stove, but your topping idea is totally new to me! I’m going to try it next time I make pop corn for my movie date with friends here at home. Maybe try agave nectar as a replacement? I eagerly look forward to each new post! This one has become a favorite of my whole family (minus the 4-month-old baby ;) You’re a fabulous photographer, creative cook, and refreshing writer. As a busy mom of three, I love the yummy simplicity of your recipes! Keep up the great work! I’ve read some articles before that popcorn is a good snack if you are on a diet. I will try this one out! This looks delicious! Just wondering: is there anything that can be used in place of grapeseed oil? I don’t own it and I’ve never used it in anything else, so I’m somewhat hesitant to buy it! Alternatively, what else do you use your grapeseed oil for? Leah ~ You can replace the grapeseed oil with canola oil or even unsalted butter…but I prefer the health benefits of grapeseed oil. I use it in place of canola oil for everything and use it for baking, frying, and cooking. It’s wonderful because it has a high smoke point and has a lot of antioxidants in it. Yay, it looks like I’ve found something I can use as a party snack for my sister-in-law’s baby shower, since she is now eating gluten-free, egg-free, dairy-free and soy-free. Much more fun than the plain popcorn I was contemplating serving! When (ha! that’s rare) there are leftovers we make popcorn balls and put them in the fridge for later… delish! I just made this. WOW! It was so good. Messy, but delicious!